Still morning in Stonington, Maine | Oh, the Places We See . . .
Gray day in Stonington, Maine, with almost no one in sight. October in Maine offers colorful leaves and paths to lighthouses teeming with tourists, but some days during early morning hours are simply still. Especially at Stonington. One of our favorite places to visit in Maine, Stonington is a working harbor where more than 300 boats bring in some of the biggest lobster hauls in the state. On any given day in the summer, you can expect to see lobstermen in full swing heaving heavy traps out of boats onto shore and tourists bustling around town, cameras in hand ready to capture shots of the town that time forgot. It’s the oldness of Stonington that appeals to us — from buildings that have withstood blustery winds and frigid winters for years to the people who work the waters the way their fathers and grandfathers did. 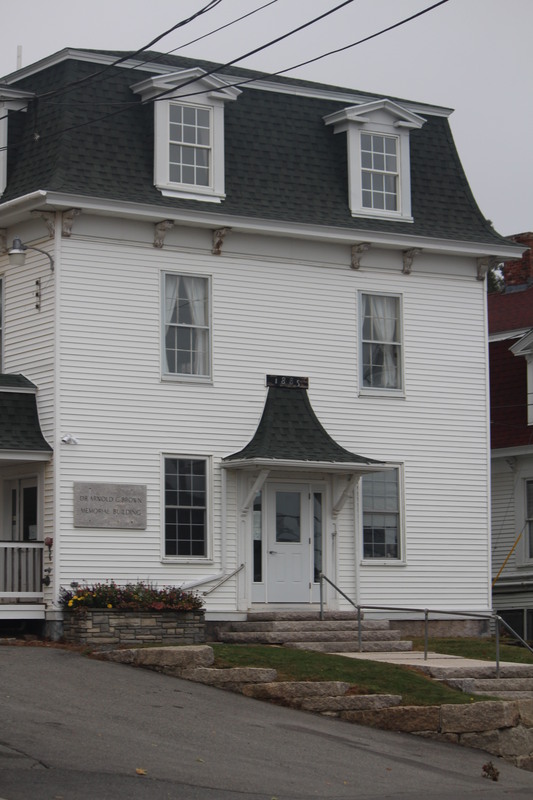 The Opera House dominates the landscape of the town of Stonington, Maine. But on this particular morning, a light fog settled on the landscape, covering both the shore and the waters in pale gray. Small house in Stonington Harbor on a gray, lonely day. The town of Stonington, usually busy with tourists shopping, eating at restaurants, and being entertained at the Opera House, was empty . . . as were most touristy towns after Columbus Day, the unofficial start of winter in Maine. 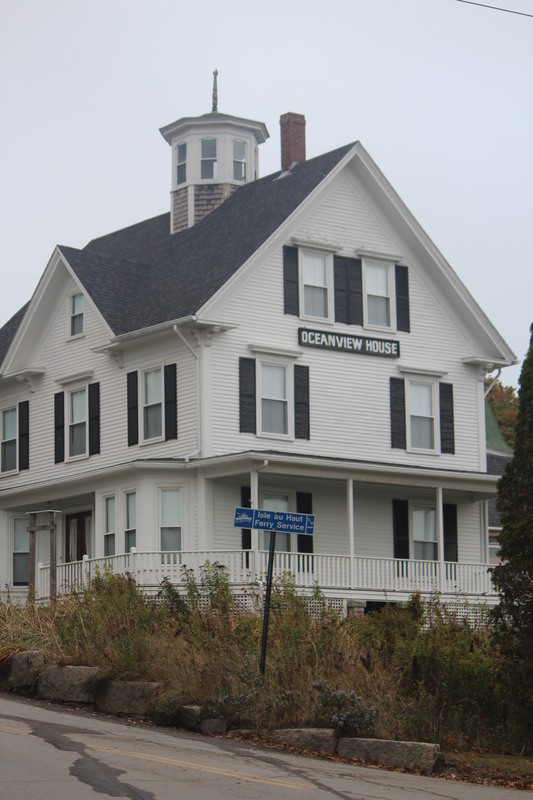 Closed for the winter: Oceanview House. 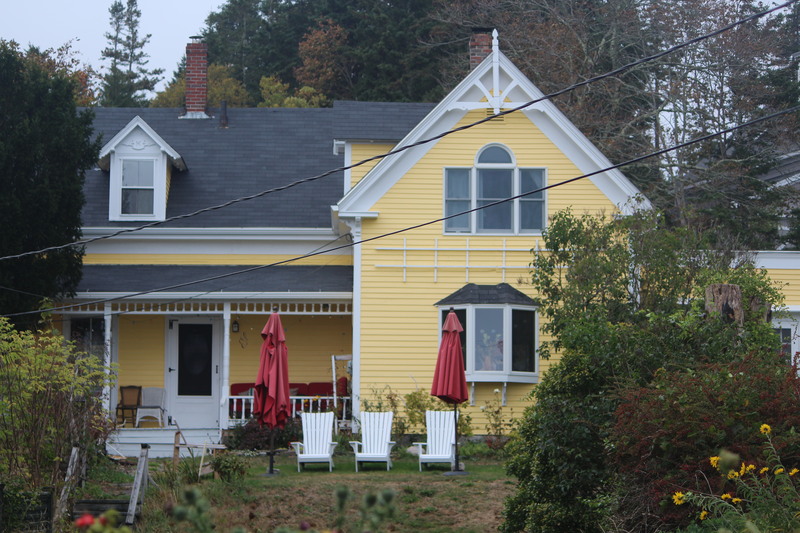 One of the most painted houses in Stonington — the little yellow house on the harbor. Standing still against the wind: a historic Stonington home. This usually busy harbor with no one in sight (shore birds and seagulls excepted) offered only the sounds of frothy waves and flags flapping in the wind. Empty now, but a usually busy summer rental right on the harbor: Catbird Seat in Stonington. Staring back and standing his ground! We scanned the landscape for color anywhere we could find it — from the red of a life preserver . . .
Gray scene with life preserver: Stonington harbor. to the gold of lichens (or some such growth) on the banks. We counted ourselves lucky to be viewing a wintry scene alone in one of Maine’s most active harbors. Stonington, Maine: looking good in any weather! Have you been to Stonington? We’d love to know what you think of this lobstering town Down East. Visit Maine has more info on Stonington. For rentals, check out Island Vacation Rentals. For more of our travels in Maine, check out Autumn Down East. This entry was posted in Autumn Down East, Maine, Photography, Travel and tagged harbor, Maine, Stonington. Bookmark the permalink. For a Mainer like me I recognize the tone of this post. I get the tone of this place, too, and I’m not a Mainer. But I love this scene! The fog rolling in and out creates a place I can’t find in Tennessee where I live. So glad we came on this particular day — gorgeous! Right now it’s about 40 and foggy. But we’re expecting some better weather. Although I would love to see all of the lobster hauls coming in, the quiet of your photos is very appealing. Perhaps just coming back from bustling SE Asia makes me the serenity al lthe more appealing. Thanks for your comments, because I feel the same way. Summers are quite hectic, and with few parking spots is hard to negotiate around this little village. We loved our quiet day, and the fog or mist or whatever it was just added to the ambiance! You’ve captured the quiet beauty of Maine off-season. Terrific series. Thanks so much, Jane. We had a marvelous month in Maine, and I love revisiting through my photos. I appreciate your comment because we would return off-season again — because of the quiet! Lovely post about a beautiful place. Living in an environment that draws many tourists during the summer I always enjoy seeing tourist attractions in their off months. So much more peaceful and lovely, don’t you think?! I agree with you about the enjoyment that comes by traveling off season. We found solace in standing alone on several piers, shores, etc. and just looking off into the distance by ourselves. It was a rare occasion, but one I’d recommend. Hopefully, I’ll write a post on the why people should travel to Maine in October — it may be against current recommendations, but we found much to enjoy! This is the first time I am hearing about Stonington and it seems very charming. I would love to explore this charming place, especially that area with the boats! It really is a town that time forgot. Everything is “old style” when it comes to lobstering. And living, too, it seems. No one is in a hurry. The most exciting part of the day is when the fishermen return to the harbor with a catch. Ah, the life! Although foggy, your photos still capture the beauty! Love seeing working harbors, so thank you for sharing this one. Love the photos and the colors. Places like this have a special charm in off season and as well the benefit of being there without the throngs of visitors. Lovely. You’re so right. We loved being there in the off season. However, I’d like to spend a week in that little house called Catbird Seat watching the action in the harbor each day. Stonington is worth a visit, for sure. I am going to look it up on the map. Can’t be that far from me. Kelly, you’re right. It can’t be too far. Hope you get there this spring or summer. It’s a neat fishing village and the one big restaurant on the harbor has plenty to make you want to come back! You ask good questions, and I really don’t know. We thought most things would still be open, but we could find only one restaurant and two shops available. Everything just shuts down after Columbus Day, even in a mild October! Thanks for taking a look. We spent a week just outside Stonington, but even in August, the water was too frigid for me to swim. Thanks for taking a look at this post on one of my favorite towns in Maine. I agree — the waters probably aren’t for swimming. Evidently, though, they’re great for fishing and lobstering. A quaint place with lots of old-time scenery!